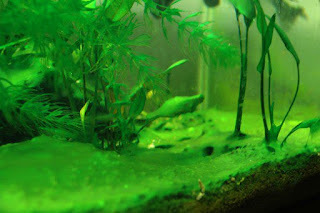 Last article was part one of my aquascaping tour in Portugal. In the first visit of the tour we went to Aquaeden, an amazing shop located in Malveira. In today’s article we are going to pick up where we left off. After leaving Aquaeden we headed back to Lisbon, the destination was the “Parque das nacoes” (Nations park) to visit the “Florestas submersas” exhibit. 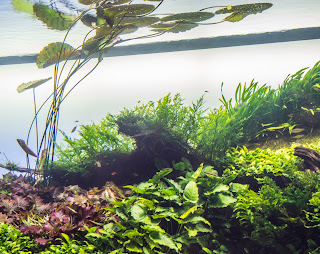 This was my fourth visit to Takashi Amano’s amazing 40 meter long aquascape. The first visit was in the first weeks after it opened and it blew my mind away. 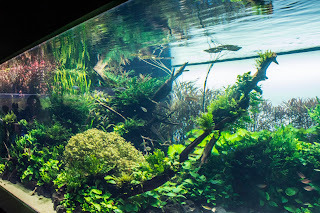 It was the most impressive aquarium I had ever seen, second visit was at 5 months old, the purpose was to see the scape in a more matured state, it was still and impressive moment, however it did not have that blown away feeling of the first. 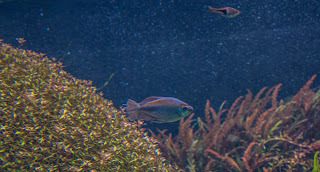 The third visit was this year in March as part of the scapetour Europe, I didn’t expect the visit to blow me away, the main reason for me to do a third visit was really the scapetour, the chance to meet aquascapers all over the world. 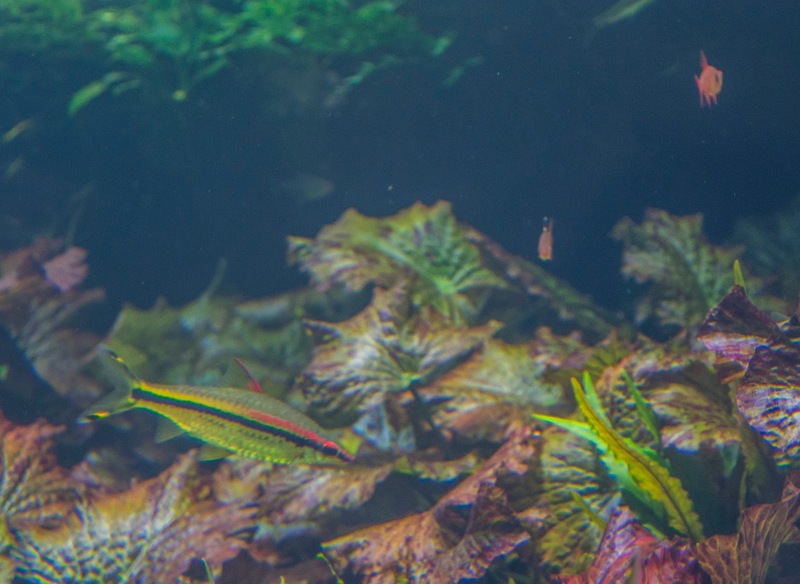 Thad didn’t disappoint, it has been the highlight of my aquascaping year, and it opened the door to an international community of aquascapers, this blog owes much of its success and visibility to that visit, as before that it was relatively unknown. I met so many amazing people most of which I am still in regular contact until today, so I can say that it did blow me away, only if in a different level. 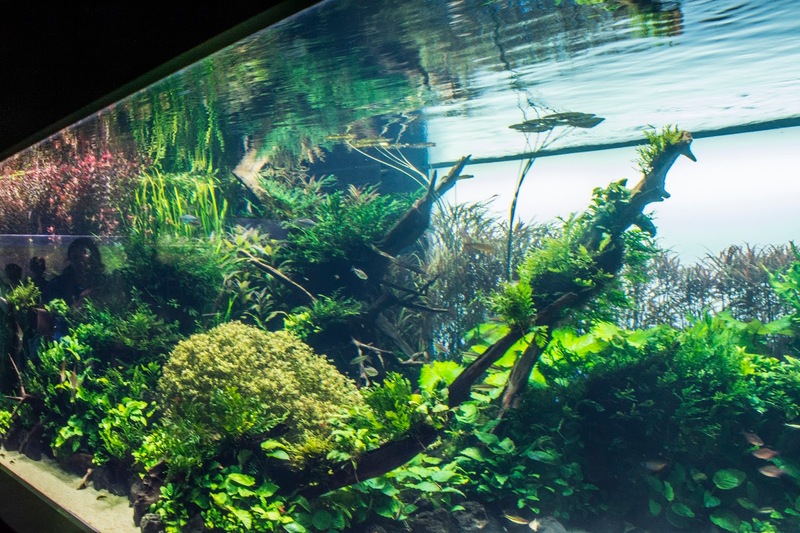 But I digress, at the center of that third visit there was Amano’s masterpiece and it was amazing to see the same blown away look in the face of my fellow aquascapers, but the tank also surprised me as,in a way, it was like rediscovering something you had lost. See the first two visits had been at the beginning of the exhibit, the third was almost two years after, and it was astounding to see the fully matured tank now. So, for this fourth visit I decided to go alone, my wife having seen it two times already had no interest in going again, and for me I wanted to be able to have the experience of going alone, just me, the scape and my thoughts. Another goal was to do a video on it, I did videos of the first two visits for my AQUADesign youtube channel, however I did not do it on the scapetour as I was there to spend a good day with my fellow aquascapers. I felt a video of the fully matured aquascape was in order. We left Aquaeden at around 12.45 and headed back to Lisbon, as it was lunch time and we were both starving, we decided to stop at the Vasco de Gama shopping center just a few minutes from the exhibit. Getting to Lisbon was easy, finding parking spaces in the area and move around the traffic was a bit more complicated, so my suggestion is if you want to come to the exhibit, take public transport as it will make the experience a lot more relaxing. We sat for around 45 minutes having a nice Portuguese Lunch, and then I made my way into the exhibit. As I was booking my ticket at one of the machines, a friendly staff member told me to make sure to check the main exhibit (salt water) , for which you have to pay a ticket regardless if you do, as there had been a few new additions including a new tank. Sadly, or not I had to decline the offer, as my tour was already behind schedule and to be honest after seeing it for at least 10 times already, I don’t think I can bear another sight of it. But if you are on your first visit to the oceanarium I thoroughly recommend it because it’s beautiful. So, I made my way up the stairs thinking of what I was expecting to find, to be honest it’s only been 6 months since scapetour, so I was expecting everything to be just the same as the tank was already fully matured by then. 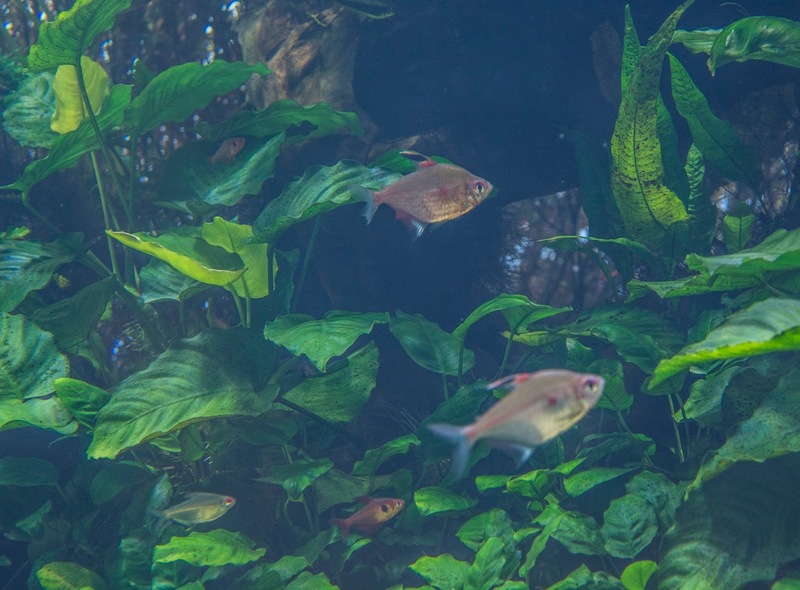 But as we know an aquascape is a living thing and as such there was some differences that captured my eyes immediately, others made themselves evident over time. It was obvious from the get go that there were some differences in the plants and fish. In the plants, the difference was that the tank felt even more matured than before, I will have to elaborate on this, different plants have different rates of growth, and maintenance at this exhibit is always on going, so it means that not all the plants get trimmed down at the same time. So, you may come in at a time where some plants have just been trimmed recently so they may not look at their best. It was obvious to me that I came at a time that most of the plants were at their best, colours seemed even more vibrant, some plants looked even taller and bushier than before. 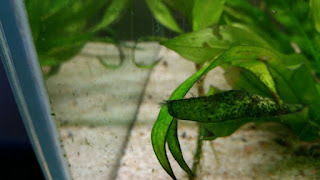 Not because of the tank maturing, as after more than two years it’s hard to get it more mature than it already is, just because I came at a different stage of growth of the plants. there was less of them and were starting to show their age. This time however most of the wood was covered in very healthy ferns, I am not sure if it’s the result of the ones that were there just having grown in again, or new ones being added, but I am 100% sure they are looking much healthier than last time. 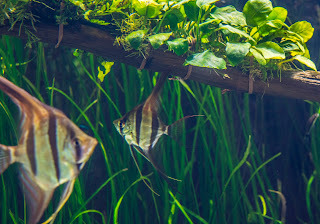 What also became apparent was the changes in fish, first obvious change was the introduction of Angelfish, I am not sure but they looked like altum angels. There were quite a few of them swimming in together. 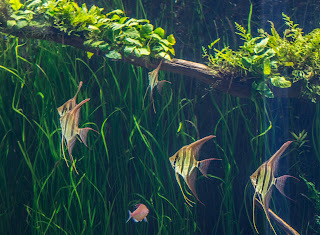 They don’t seem to stick to specific areas of the tank like other residents, as I found them swimming throughout the entire length of the tank even the sides. It was also obvious that a good amount of the original fish population of the tank is gone, a lot less schools of neons and cardinal tetras can be seen as opposed to before, though they are still present this time I did not get the feeling, that there were thousands of fish in the tank. 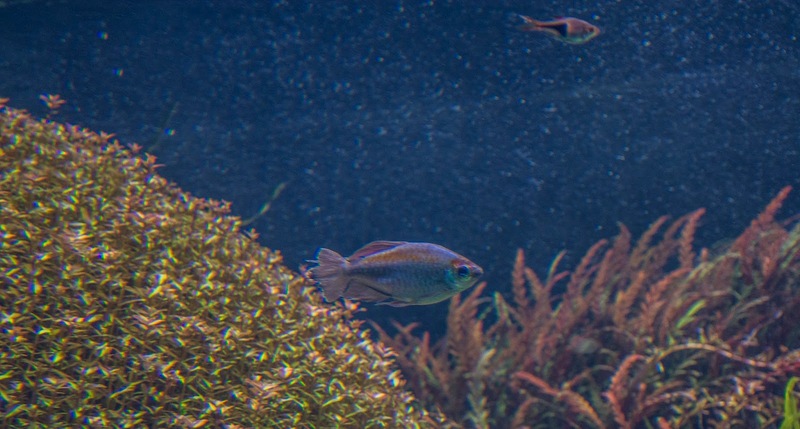 It was obvious the amount of small to mid-sized fish in the tank is now more even than it was in the previous visits. Amano shrimps can still be found everywhere grazing on the sand helping keep it clean. Last time I was in the exhibit for a full day, today only had about an hour and a half, so after spending my time recording footage and taking pictures I finally sat down to relax and let the scape and its nice music sink into my mind. Despite the sense of novelty being gone, it’s still one of the most relaxing experiences I have ever experienced. A sense of age as timeless as nature is felt when looking at the tank and its residents, I have seen the videos of this tank being built, I have even met some of the people that took part in its conception, one in the person of Rui Alves just a few hours before this visit. Still I can sit in front of it and almost forget that its man made, if not for the glass and surroundings I would almost believe that this is nature in its truest form. Takashi Amano himself defended man should have a closer connection with nature, that over the decades that link had been broken. It’s a bit sad, that we revere man made nature, but fail to notice the one that was here before us and still to this day surrounds us. The exhibit was supposed to finish soon, though during the scapetour we were told that they were looking at keeping it for as long as It was possible to maintain the tank healthy, that may explain the changes in type of fish, so it’s now about two and a half years old and its fully matured, I couldn’t stop myself feeling some sadness that Mr. Amano never got to see it this way. I’d like myself to believe he did, that in his mind he had a full picture of how the scape would look fully mature, it also helps enhance the brilliance of the man, at least in my mind. But the reason I brought the length of the exhibit to the discussion is because by now it would be expected that the world and its mother would have seen it, meaning, whoever wanted to see it would have seen it and so attendance would be declining and it would make sense to think about shutting it down. This is not the case; the exhibit was full and as I was wandering around trying to do my video I found it harder to do it this time than in the first visits. Interest in this exhibit is still going strong and two days after my visit I had even more confirmation of that as IAPLC 2017 winner Josh Sim was in Portugal and attended the exhibit together with Rui Alves from Aquaeden. 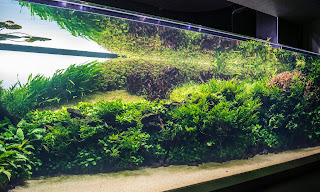 I know that being able to keep it healthy is always going to be a factor in the longevity of this aquascape, but it’s clear to me that interest in seeing something like this is high, so I wonder with Mr. Amano gone is anywhere in the world someone whiling to take up is mantle and make another one,? Will aquascaping and the Nature aquarium start featuring more regularly at public aquariums around the world? There would be no better way to bring in aquascaping into a wider audience. I have written about Forests underwater before in this blog, two times here to be more exact, I also have as many videos of it in my youtube channel, some may have come to this article expecting more technical details about this scape, I felt that all that has been discussed many times, even by myself. 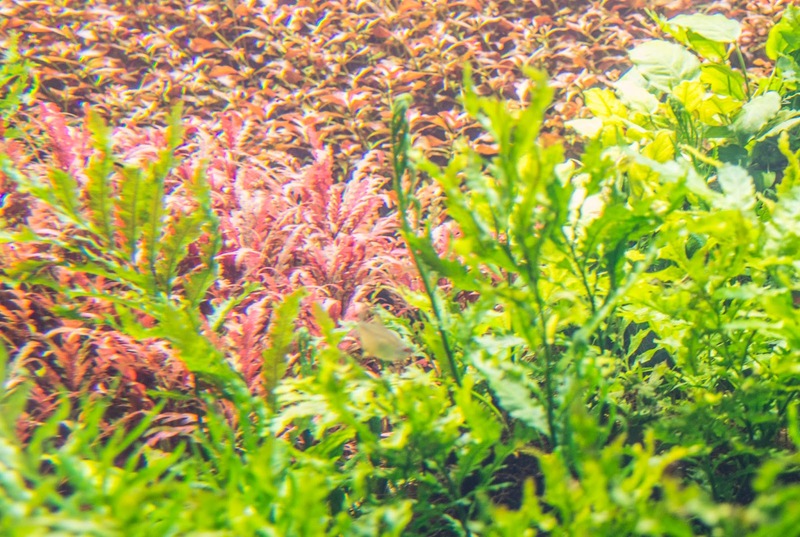 I wanted this part of my article to be about a personal reflection on the significance of this project, my article is also about aquascaping in Portugal, and I think you cannot deny the impact this project had here, but also in the world. 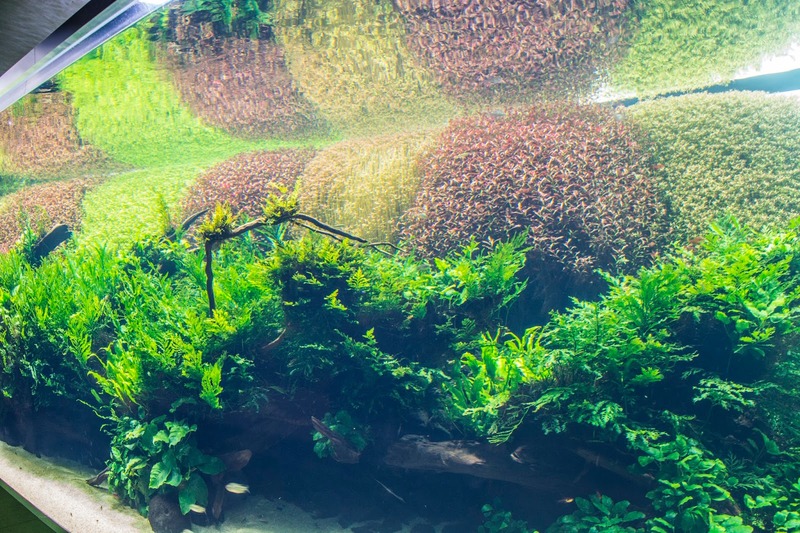 There’s no aquarium capable of uniting hobbyists, nor one that as broken its physical boundaries and really brought the aquascaping community together like this one. Its more than the sum of its parts, more than the tons of lava rocks, wood and aquasoil, more than the equipment that powers it and the plants that give it colour. It’s even more than Takashi Amano the man, more than his legacy in the hobby, which was already indisputable before this came to life. This was his parting gift, even though he didn’t know it at the time, so I must ask again. Is there anyone out there willing to take his mantle and give us the next Forests underwater? I hope there is, this should be a stepping stone for aquascaping, not its pinnacle. This may not be my last visit, but I believe it’s my last article and video on it as there’s nothing more for me to say about it. After some time of reflection I left the exhibit, we then proceeded to drive south into our next destination. The next article will be about Solucoes aquaticas (Aquatic solutions) , a shop in the south bank of the Rio tejo (Tagus river). Two my knowledge the only shop dedicated to aquascaping in the south of Portugal, and the closest to my hometown. Following are the videos for the video on today's article as well as my first two visits. If you like the video and would like to see more, please consider subscribing to the AQUADesign youtube channel. If you like this article and would like to keep up with future articles please consider subscribing to the blog.